Welcome to the DormCo Futon Giveaway! DormCo’s Full-sized Red Collegiate Futon ($200 value) is a college dorm room staple. The Red Collegiate Futon has a durable oxford fabric exterior that is designed for durability and wear resistance. You can fold it into a bed or use it as dorm seating. It is also easy to scrub down if you should spill something on it! 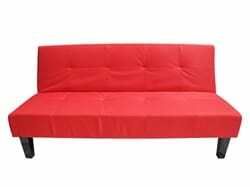 We invite you to check out the DormCo Red Collegiate Futon Review. I would love to have on of these trunks in black on wheels. Flokati College Room Rug – Tan looks plush and nice. The 3″memory foam TXL mattress topper. I would also love to have the Ultimate Dorm Lounger & Foot Rest! DormCo Red Collegiate Futon would love to have the in my kids room. I like the Rolling Underbed Cart. I also like the College Plush Rug – Downtown Purple. Thanks. I would love to have the Neverlate Executive Alarm Clock. I would love to have the College Book Tower White – Way Basics Dorm. Hoping to win this for my son and love that it is the color of the college he is attending.